Negroamaro, Aglianico, Champagne—how could you choose one? After studying with a sommelier in 2010, Lori made it her mission to escape New York and explore the richness of the European wines she fell in love with directly at their source. 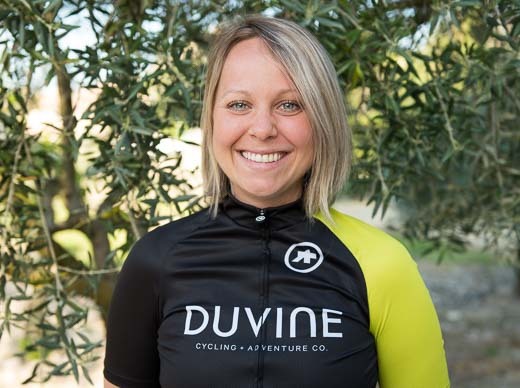 Her travels began in Italy in 2016 with only her road bike along for the ride. She spent an entire unplanned year bouncing around the EU and discovering the culture, food, architecture, history, and landscape—mostly on two wheels—until she finally landed in South France. Lori has worn many hats, including teaching at a Montessori school, being on the distribution end of the wine industry, operating a health and nutrition business, and teaching yoga. She kicked off her very first work teaching Yoga for Cyclists at her local bike shop in 2015. If she knows one thing, it’s that the best way to discover and explore is with all five senses, the wind in your hair, and the pedals under your feet.